I would've posted more photos by now, but I'm in the process of buying better photo editing software. Just not happy at all with what I've got to work with now. In the meantime, since I have been saying so many wonderful things about Scotland, I bet you're wondering if there was anything I didn't like. Well, a few minor things. Me: Do you have salad dressing, salad cream, mayonnaise...anything to put on the salad? Waitresses: [Blank look. Blink, blink.] Oh, just a moment. A short time later, a bowl of mayonnaise showed up on the condiments table. 2. There is no such thing as iced tea in Scotland. (Excuse me, I'm Southern. I can't help it.) On the rare occasions when you do find iced tea, it comes out of a bottle. 3. Ice in drinks is rare in Scotland. If you have it, cherish it. 5. Though it has nothing to do with Scotland, since I'm on the subject of irritating things, I have to say how much I loathe airplane seats in coach. They are torture devices. My tailbone was sore for days. 3. I LOVE shortbread cookies. 4. Their pot lids are so freaking heavy I couldn't pick one up. We were having breakfast in this hotel on Skye, and sitting with our guide. The scrambled eggs were in a pot on the buffet. And I kid you not, I could not lift the lid to dip some. Trust me, I'm not a weakling, but the only muscles one could use to lift it were the muscles of one hand and forearm because it was under a hood. It must have weighed 15 or 20 lbs. Solid iron. Anyway when I admitted my embarrassing shortcoming to my friend and our guide, they both raised brows and snickered. My friend will never let me live it down. But she didn't try lifting it! 5. Scottish bacon is like ham, and very good. 6. Scottish sausage links are as huge as salami (almost.) No, I didn't try one. They looked too much like... well... I can't say that here. 7. Each and every shower we encountered was a mystery and a puzzle. What fun figuring out how each one worked. Not! My friend alternately scalded or froze her feet. Once I got in there, I walked out of the bathroom carrying the knob from the tub faucet. Then we discovered it was unnecessary decoration. 8. The restroom is not called the restroom in Scotland. Nor is it called a bathroom. It's a toilet, pure and simple. Each toilet (commode) is also freakishly different from the one before but the flush lever is on the right side. One stainless steal one didn't even have a seat, nor was it supposed to. 9. I found the currency surprisingly easy to learn. You have your pound, which is roughly equal to slightly over 2 US dollars. This comes in a one pound coin, which is about the size of a quarter but thicker and pale goldish in color. There's also the 2 pound coin, which is slightly larger and has both bronze and silver on it. They don't use the word cents. It's pence. The coins are: one penny (very similar at first glance to our penny), two pence (larger and copper also), 5 pence (very similar in size and color to our dime), 10 pence (very similar in size and color to our quarter), 20 pence (a wee bit smaller than our quarter, and thinner, but with 7 sides. See, I almost said hexagonal.) Is there a 50 pence coin? I can't remember. Anyway, a hundred pence equals a pound. And the queen's head in profile is on almost every coin and every note except those issued in Scotland. As for notes, you have your five pound note (or bill? not sure the correct term here.) Then there's 10 pounds, 20 pounds, 50 pounds, and probably more but I don't have intimate experience with those large bills. So you see, it's very easy to figure out how to use the money of the UK. 10. A hamburger bun is called a bap. 11. Scots hate midges (tiny little gnats that bite) so much they write songs about them and refuse to wear kilts in their presence. Yes, we did encounter some midges in Ullapool. But from what I could tell, the midges are not nearly as bad as the gnats and mosquitoes of NC. For one thing, they're slower and a little bigger than your normal gnat, so you can feel them on your skin and swat them away before they bite. But maybe we weren't visiting during the swarm season. 12. While we're on the subject of insects... omigosh... I found a tick stuck on my leg, also in Ullapool. It was so tiny it was the size of a pen dot, or a pin head, take your pick. Never saw one that small before. I'm lucky I saw it at all. After getting it off I needed to know if it transmitted any deadly disease like Rocky Mountain spotted fever or lime disease so I tried to call our guide. Couldn't get him so I called the front desk. The man working there said "Oh, it will probably fall off during the night." Huh?? As if I'm going to wait for it to engorge itself and fall off?? No that's not what I said to him. But when I informed him I had already removed it, he said, "nothing to worry about then." I didn't come down with anything. Huge sigh. This should technically go up with the "things I disliked" section but my friend likes to tell it with the pot lid story. If I think of any other must-have knowledge I'll let you know. We stopped for lunch at a little remote restaurant near Durness that had great food. Afterward I discovered what would turn out to be one of my favorite places in Scotland--Sango Bay. This is an award winning beach, and it's easy to see why. I love, love, LOVE this beach. It's the most beautiful beach I've seen, ever. The photos don't really do it justice. I don't know why this little spot grabbed me and wouldn't let go. Hardly anyone else from our tour even saw it, much less walked on it. The rocks jutting up out of the sand and sea here are spectacular. Some are black and some are pink (granite or sandstone?) It was too cold here to swim or lie in the sun or any of the various other beach activities. And of course it was cloudy. This beach faces north, or slightly north east because it's on the north coast of Scotland. The ocean is the Atlantic. If I'd had time, I would've sat out here on one of these rocks all day. I created a "movie" with music and also uploaded a series of photos so you can see them large if you want. Click below for your preference. In the movie, you'll see a house upon the cliff. That's where I want to move! Click for just the big photos in a slideshow. Sorry for the delay in getting the photos from the next segment of my trip up. I have several good photos and would like to make another slide show...or something. I was playing with Windows Movie Maker and created this, just for fun. 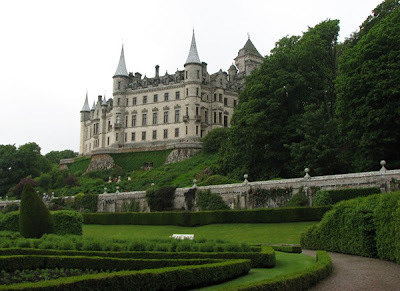 A look back at Dunrobin Castle, complete with music. (No, not Scottish music. Beethoven. This was just an experiment.) I like these little movies. The only problem is the photo quality diminishes once I upload it to YouTube or Photobucket. It looked much better on my computer before. Anyway...hope you enjoy. 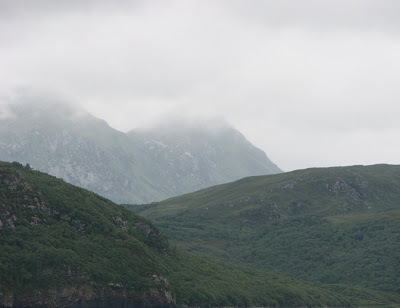 On June 23, we drove from Thurso along the remote and breathtaking north coast of Scotland, through Bettyhill, Durness and all the way to Ullapool. I'll only cover a half day here, up to just before we reached Durness. Since we didn’t stop much, I set my camera to the sports setting and snapped a lot of shots out the coach window. Sports because of the movement and faster shutter speed. Some of the photos were still blurry but several turned out well. The photos speak for themselves. The area is hauntingly beautiful--moors, mountains, lochs, streams, the ocean and more mountains and moors. The land appears almost untouched by human hands, but I am always aware that two or three hundred years ago, the area was far more populated. The Highland Clearances left it deserted. The people lost their homes and were forced to sail to strange lands. As we were driving through, I could almost see into the past to a time when crofters and clans walked across the landscape, herding their cattle, growing oats or digging turf from the bogs. It’s sad they had to leave a land as gorgeous as this. I noticed something interesting about Scotland--the sky is very much a part of the landscape. The clouds hover then come down and touch the earth. For me, this only added to the beauty and mystical atmosphere. I thought I'd try something different with the photos this time so you can see more of them and in larger sizes... a slideshow on another site. Please let me know if you have a problem viewing them. 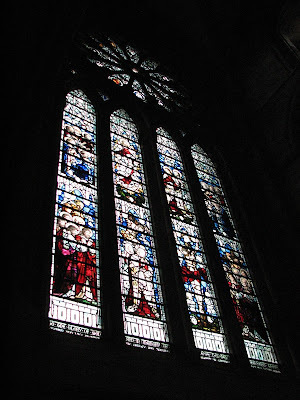 After lunch in Kirkwall on Orkney, we had a guided tour of the fascinating and beautiful St. Magnus Cathedral. 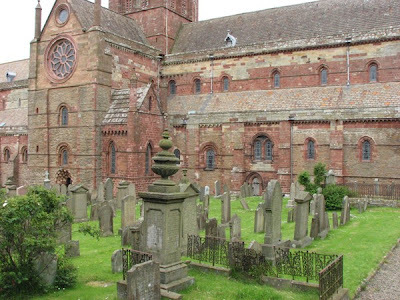 It is the most northerly cathedral in the British Isles, and considered "one of the finest and best preserved medieval cathedrals in Scotland." The architecture is Norman. 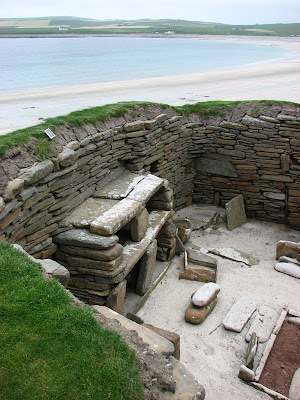 Orkney was held by Norway and/or Denmark for centuries, from sometime during the 800s until 1468. King James III of Scotland married Princess Margaret of Norway. Since her father, the king, couldn’t pay her dowry, he used Orkney and the Shetland Islands as collateral. A few years later, he still hadn’t paid, so James annexed the islands and they became part of Scotland. Construction on the cathedral began in 1137 and took 300 years. 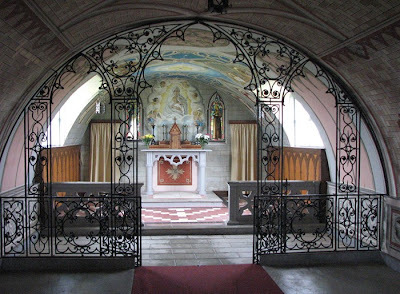 Earl Rognvald of Norway initiated the project in honor of his uncle, Earl Magnus who was killed around 1115 – 1117 and became a saint in 1135. His story is detailed in the Orkneyinga Saga. 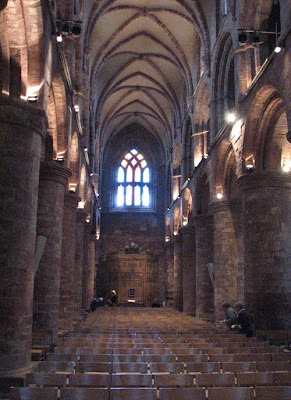 This Cathedral is unique in that it actually belongs to the City and Royal Burgh of Kirkwall. It is not, and has never been, the property of the Church. 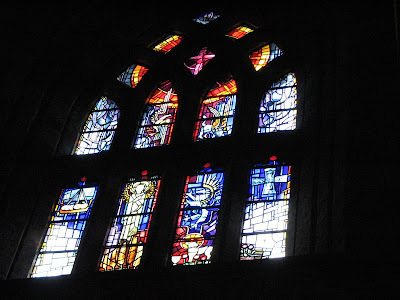 It has housed Catholics, Episcopalians and Presbyterians, complying with whatever the "official" religion of the time. 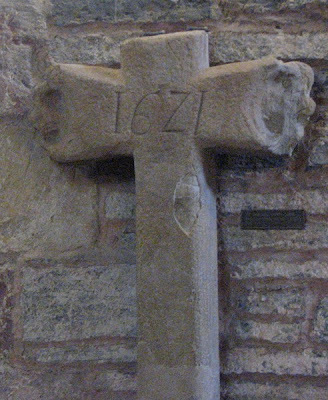 This cross with the date 1621 used to stand just outside the cathedral. At the market which was held there through the centuries, people would tie their canopy ropes to this cross and it was eventually broken. Now it is well taken care of inside. 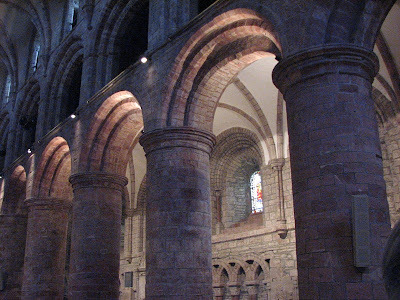 St Magnus Cathedral is the only cathedral in Britain to have its own dungeon, "Marwick's Hole." 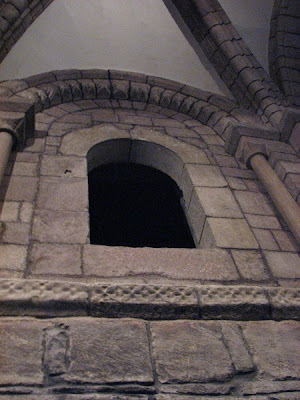 (above) Criminals and witches were imprisoned here beginning in the 1500s. 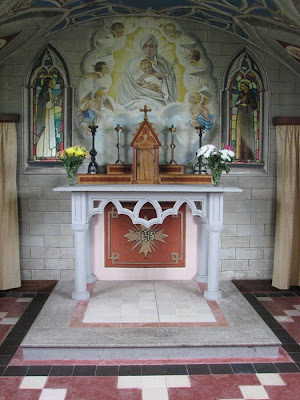 These Italian POWs were very enthusiastic in building their chapel and creatively used the Nissan huts they were given along with concrete, paint and scrap materials. You may wonder what a Nissan hut is (I know I did.) It's one of those plain metal buildings you sometimes see associated with WWII that look like a half barrell turned on it's side. See the rounded shape of the room? I find it amazing they could create something so beautiful out of these materials. 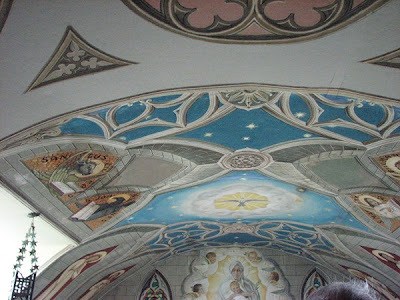 Most everything you see, tiles, plaster and intricately carved wood is actually Trompe L’oeil, a brilliant painting technique which tricks the eye. After this, we boarded the ferry and cruised for Scrabster and our hotel in Thurso. 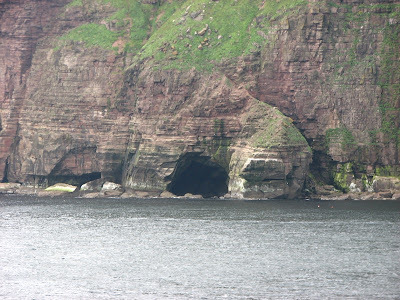 We had a very enjoyable conversation with one of the crewmen on the way back as we stood on deck and again observed the cliffs on Hoy and he told us about the local wildlife, especially the abundant bird population. We were hoping to see some seals or orcas but didn’t. The man, who had a wonderful Scottish accent, told us that about a week or two before, a pod of orcas had been seen there. While on board, as part of the tour, we had tea or coffee and scones. They were delicious. 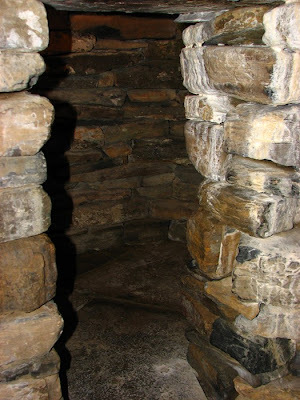 After leaving Skara Brae, we visited the "Heart of Neolithic Orkney" which has been designated a World Heritage Site. This area surrounding the Ness of Brodgar contains a concentration of Stone Age ceremonial monuments. 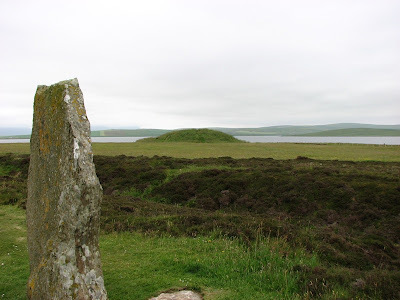 The main site we visited here was the Ring o' Brodgar, an impressive standing stone circle on a thin strip of land between Harray Loch and Stenness Loch. We walked around inside the stone circle while our specialist guide told us all about it. The Ring o' Brodgar (the "d" is almost silent when the word is pronounced) is thought to date back to around 2500 BC to 2000 BC. 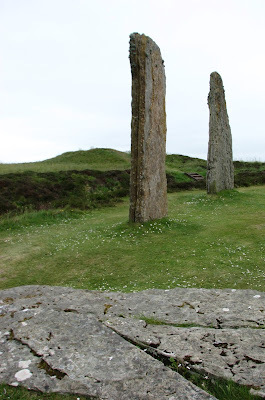 It is a true circle with a diameter of 340 feet and originally contained 60 megaliths. Only 27 of these remain standing today. They vary in height from 7 feet to just over 15 feet. 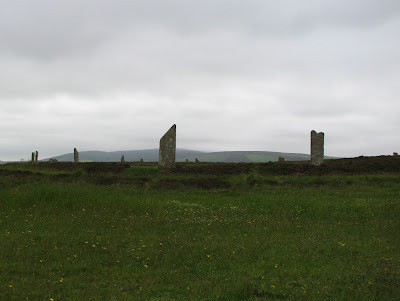 Experts believe the Ring o' Brodgar was part of an enormous prehistoric ritual complex that incorporated several other stone circles and solitary standing stones, some a mile or more away. This area has a large amount of archaeological remains including early burial sites and mounds. They are believed to have been important in the people's religion, ceremonies and relate to astrological alignments, like the setting sun at Winter Solstice, much like Stonehenge. Here you see one of the stones which lies on the ground and the path leads over it. 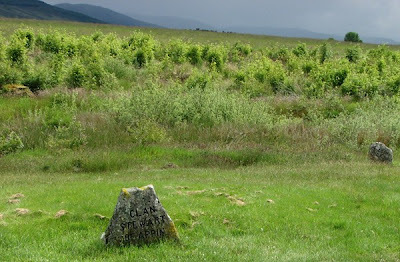 Two stones stand in the background, and a massive ditch that was originally deep lies beyond. In the far background you can see one of the mounds which was important to the Neolithic people. 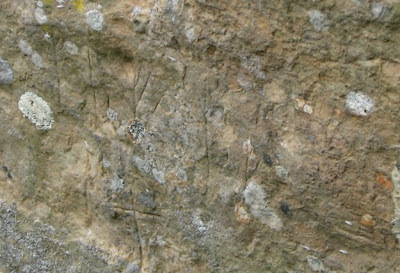 We saw Viking runes "graffiti" carved on one of the stones and dates to around 1100 or 1200 AD. It is believed to be the name Bjorn. As in... Bjorn was here. 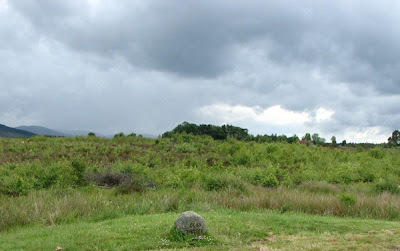 Another of the mounds near the loch. The whole area is very beautiful. 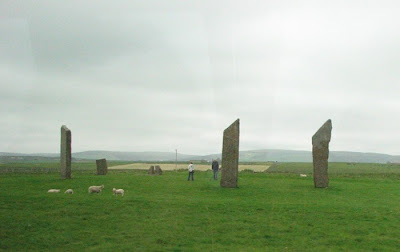 We drove past the Standing Stones of Stenness (photo above) a mile away. 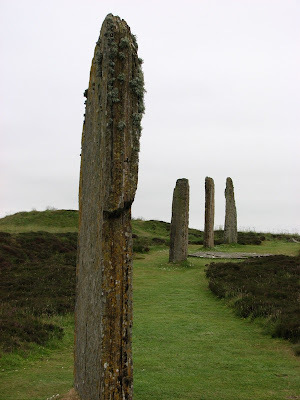 These stones are taller than those at Brodgar, some standing up to 19 feet high. 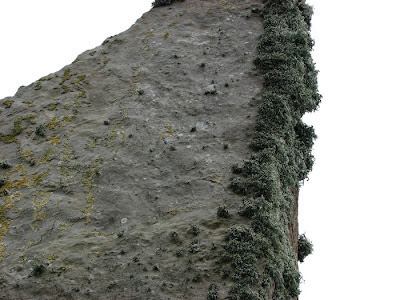 Only 4 of the original 12 stones remain standing. This site is believed to date from 3100 BC. The stones were almost destroyed by a farmer in 1814 who was fed up with all the tourists treading over his land and tired of plowing around the massive stones. He turned them over and began breaking them up. Odin's Stone was one of the more important ones, which was finally smashed to dust. After a public outcry and involvement of the authorities, the farmer was forced to stop his destruction and these few stones have been preserved. 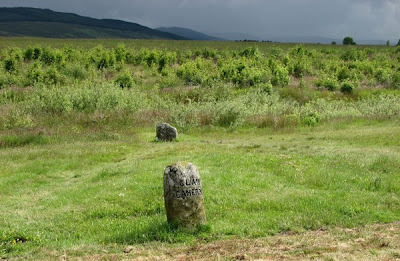 I had always wanted to visit a standing stone circle, so I was thrilled to get my wish! Friday, June 22 was one of my favorite days of the tour. 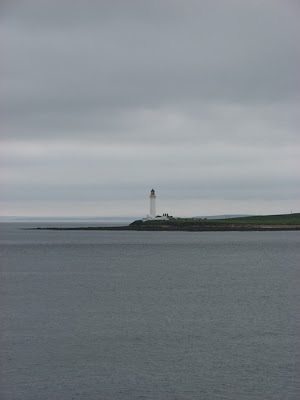 We left Thurso early that morning, drove to Scrabster and took a ferry out to Stromness on Mainland Orkney. (I love the names of these places!) I had never been on a ferry this large before. In addition to people, it hauled the bus and lots of cars. 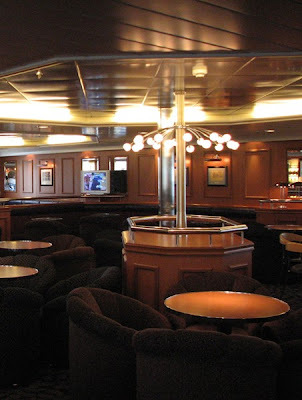 This ferry was nice with a bar and lounging area, a restaurant, a couple shops and lots of other neat places. Since my friend and I both have a tendency to get motion sickness at times, we stayed out on deck, the stern, at the beginning of the trip so we wouldn't get sea-sick. It again was very cold and windy but I wanted some clear photos too. I was wearing 5 layers of sweaters and jackets at this point and needed every single one. My rain jacket also served as a windbreaker and the hood was invaluable. 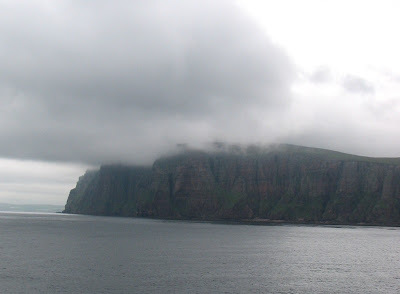 We cruised by the island of Hoy. 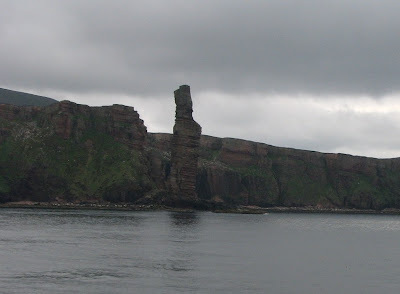 We saw the Old Man of Hoy and the beautiful cliffs. I loved it! The whole area is simply gorgeous and it seemed we were entering a primeval world. We were out here on one of the two longest days of the year. Summer Solstice was the day before and we were in the most northerly place we would visit. Needless to say, nights were very short, probably only a couple hours of darkness. 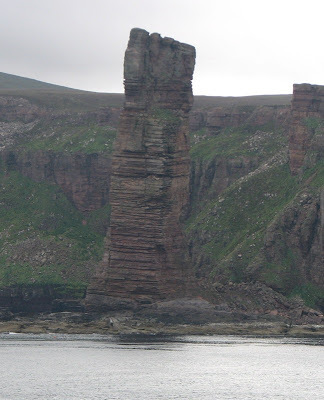 Old Man of Hoy is a beautiful sandstone rock stack rising close to the sea about 450 feet high. Many people have climbed it but they don't know how much longer it will stand before being claimed by the sea. Every view out here was lovely and I took lots of photos. 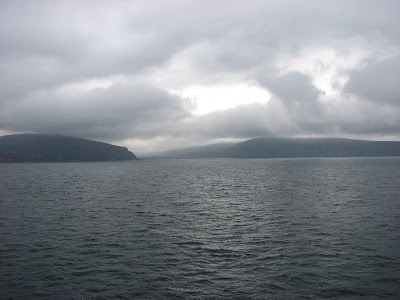 Auskerry (population 5 (2001 census)) is a small island at the east of the Orkney island group. It lies in the North Sea south of Stronsay and has a lighthouse, completed in 1866. The name Auskerry comes from the Old Norse for east skerry. Auskerry is designated a Special Protection Area due to its importance as a nesting area for Arctic Tern and Storm Petrel; 4.2% of the breeding population of Storm Petrel in Great Britain nest on the island. 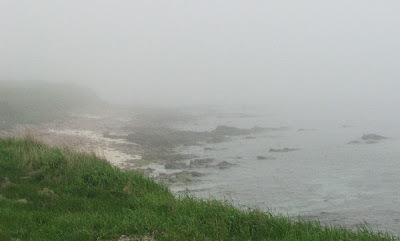 Hoy cliffs in the mist. This gives some perspective. 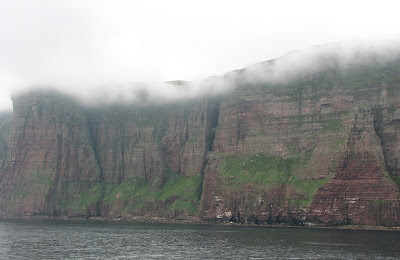 See how tiny the boat is compared to the cliff on Hoy? 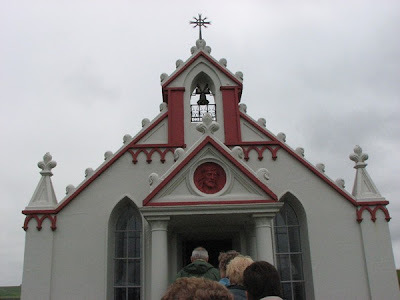 Once on Orkney Mainland, we boarded the bus again, this time with a local guide who knew all about Orkney history. Though I believe the man was English, he now lives in Orkney. Our first visit was to the amazing Skara Brae, the 5000 year old Neolithic village which was unearthed in 1850 during a storm. Experts believe the underground village was inhabited between 3200 and 2200 BC. It is a series of eight dwellings, linked by alleys. Because of the sand which had covered the dwellings for thousands of years, they were well-preserved. 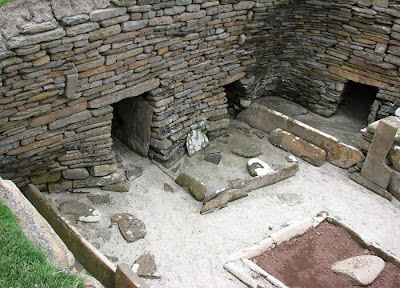 Each home has a central fireplace (shown by the reddish dirt) which is just a ring or square of stones in the middle of the floor, a sort of box bed made of stone on either side and set of stone shelves or dresser on the wall opposite the entrance. Though Skara Brae now stands right on the edge of the ocean, when people lived in it, the village would've been some distance from the sea. They believe people lived here for about 600 years. It's completely underground now, but back then it would've appeared to be mounds of earth and rubbish with roofs on top. The homes would've likely been warm and comfortable to them in such a harsh environment. 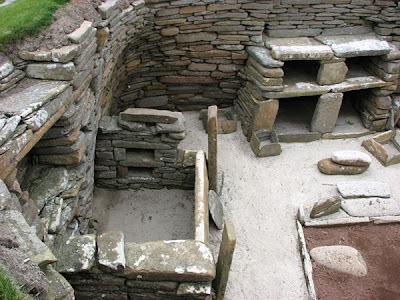 The stone box beds would've had mattresses made of straw or heather and blankets of sheepskin or deerskin. Each home also had a drainage system, which may have been an early form of toilet plumbing. 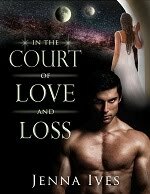 They speculate the hearth was the center of the room for several reasons. Fire was extremely important to these early peoples for heat, light, to cook their food. It was likely the center of their domestic life. They had very long dark winters here and the central position of the fire would allow more people to gather around it to stay warm. The roofs of these dwellings likely had a hole in the center to let the smoke out. They suspect these dwellings were not immediately abandoned because of a tragic event, but that they were gradually, over time abandoned as the younger people moved away into more modern housing for the time and merged with larger communities with perhaps more powerful leaders. 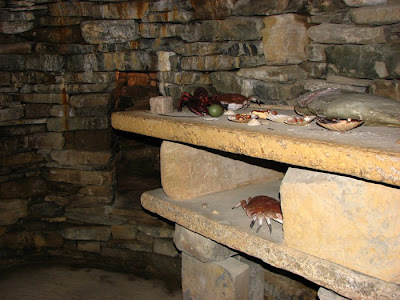 As I was leaving I entered the recreated Skara Brae dwelling. The entry tunnel was very low and narrow. I had to bend and sort of creep inside. The dwelling was dark and interesting, but I could see how it would be cozy with a fire going. I found this whole site fascinating because I love learning about prehistory. Next up, another of my favorite prehistoric sites. The afternoon of June 21, we drove north along the coast of the North Sea, through Wick and to John o'Groats, supposedly the most northerly village on the British mainland. A lot of walks, races and charitable events take place between John o'Groats and Land's End, the most southerly place on the British mainland in Cornwall. The place is named after Jan de Groot, a Dutchman who during the late 1400s ran a ferry from the Scottish mainland to Orkney. 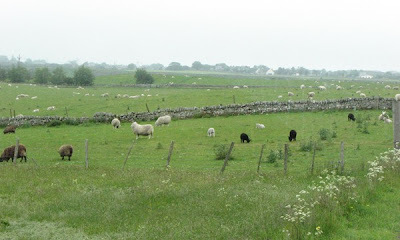 Sights on the way toward John o'Groats...A few of the millions of sheep that inhabit Scotland. The stone walls used for fencing make everything picturesque. We stopped here for a photo op and I thought this made an interesting shot, though I don't remember the name of the place. Here we saw the John o'Groats House Hotel which is closed and in need of restoration but I understand the bar is still open. The whole afternoon was very cloudy, foggy and misty. I found John o'Groats to have a very interesting and almost foreboding atmosphere. I walked alone the short distance from a shop and below the almost abandoned hotel where I saw a nice view of the harbour. The cold wind would've been chilly had I not had on 3 - 4 layers of sweaters and jackets. A big change from the 90 degree heat of NC where I live. Despite the cold, I decided to have ice cream, while my friend came back with a lamb's wool hat and wool sweater from a shop. A Viking (or Norseman) still stands guard near some of the new shops. Evidence of their historic presence remains everywhere on the north coast. The stop at John o'Groats was brief and we headed on toward Thurso (above) in Caithness where we were to stay the next two nights in the Pentland Hotel. 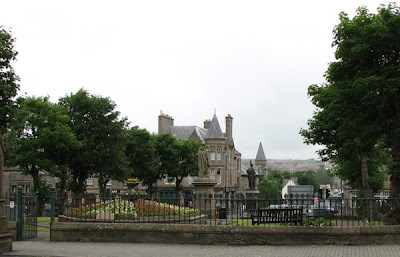 The misty atmosphere remained and Thurso seemed a gray town (lots of gray buildings) with tons of history. It was a wee bit bleak but I enjoyed it anyway. I love atmospheric settings and this was great research. Just walking down the street is fascinating because everything is so different from the US. We strolled from our hotel, along Princes Street toward the shore. 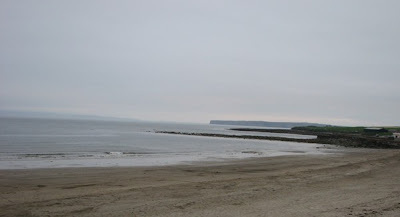 We walked on the sandy beach for a while, then along a walkway toward Thurso Castle, an interesting abandoned ruin. At the time I didn't know the name of the structure but someone in our group mentioned Sinclair. We couldn't get near the castle from where we were because a river ran between. 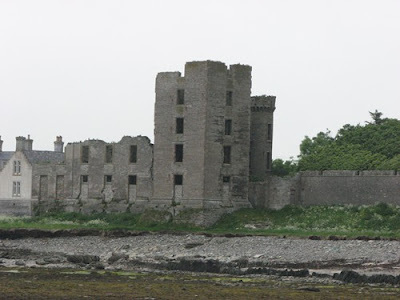 I researched it when I came home and found that Sir Tollemache Sinclair rebuilt Thurso Castle in 1878. The Gothic grandeur is more clear on the gatehouse. This is how it looked in the late 1800s. One source says a fire destroyed it. Another says it was built in an unstable way, without enough support, and when a World War II sea-mine exploded nearby this made the building unsafe. Part of it was knocked down and the place abandoned. 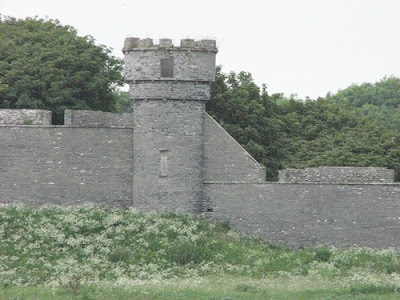 The original castle on the site dated from the 1100s and was an earthwork fortress, founded by Norse Earls. Later, during the 1600s, a stone tower house was built. Thurso means Thor's River. The Vikings lived here from the 900s. The Scots evicted them in the early 1200s. 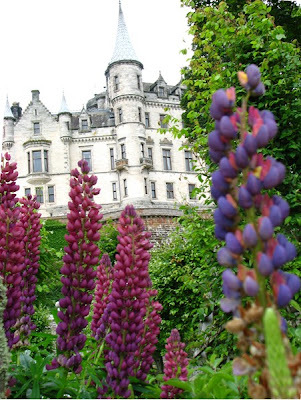 One June 21 we left Nairn and drove up the east coast to Dunrobin Castle. 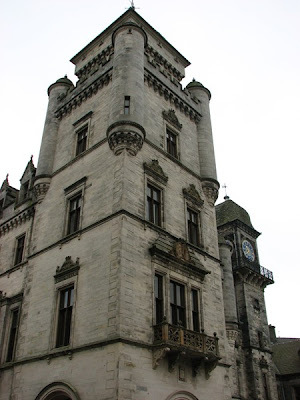 On the way, our guide taught us about the history of Dunrobin, seat of the Earls and Dukes of Sutherland and the largest mansion in northern Scotland with 189 rooms. 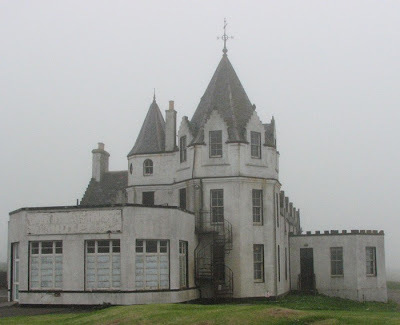 It has a sordid past because the owners, Elizabeth, Countess of Sutherland and her husband George Levenson-Gower who became 1st Duke of Sutherland in 1832, were responsible for Highland Clearances. They forcibly evicted thousands of people who lived on and farmed the land (The estate was 1 1/2 million acres.) They set the croft homes' thatch roofs on fire, even killing people who were not able to get out of the burning houses in time. These families, Gaelic speaking for the most part and descendants of the clans who had lived here for hundreds of years, knew no other home. The reason for the clearances was money. Though the owners were already wealthy and earning millions a year, they wanted more. (Even the queen thought their mansion more impressive than her own.) The advice they received for "improvements" was to kick the people out and bring in sheep. 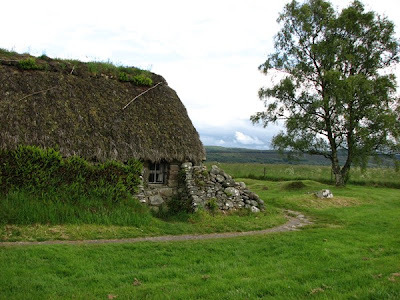 We saw abandoned stone croft homes all over the Highlands which are the sad leftover skeletons of Scotland's past. I can only hope the people who lived in them found happier and more prosperous lives whatever they eventually settled, either near the shore or on a different continent. Here are a few links if you'd like to learn more. The gardens and falconry demonstration were my favorite parts. I had never seen falconry before and have always had an interest in it. 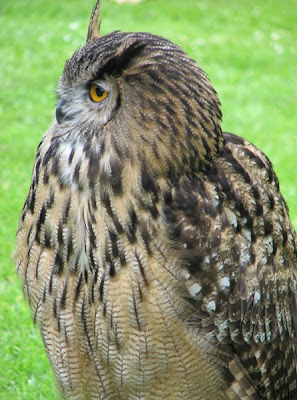 These trained birds of prey are so impressive. I was amazed to learn wars had been fought in the middle ages over Gyr Falcons and that now they can cost as much as a BMW car. The gardens were incredibly beautiful. As a gardener, I was keen to look at as many of the plants as possible. 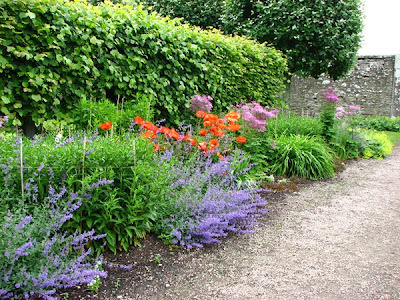 I noticed everything grows really well in much of Scotland. Due, I'm sure, to the large amount of rain and the peaty soil. 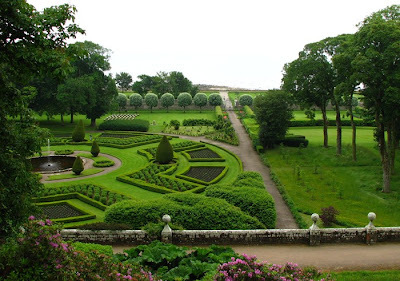 The gardens lie between the castle and the ocean. Almost anywhere you stand here and take a photo, it looks like a postcard. For lunch here I had a delicious Highland pie. This is not a dessert but a main course filled with venison and vegetables with potatoes on the side. 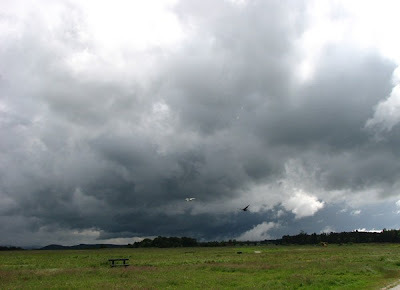 That afternoon the rain had stopped by the time we reached Culloden Battlefield. First we went to the visitor center where a man dressed as a 18th century French soldier demonstrated how the Jacobite Highlanders had fought using basket-hilted broad swords, targe and dagger. 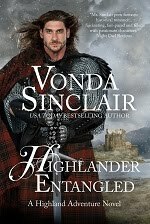 This was very interesting and informative because I have written battle scenes involving Highlanders. I have new info and insights to add next time. 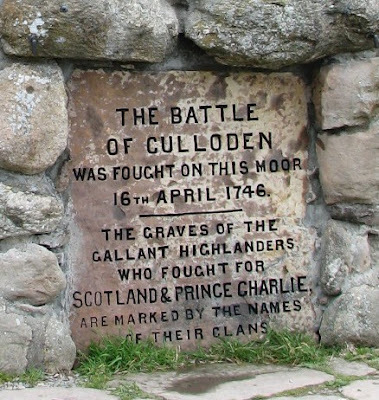 Culloden was the last battle fought (basically) between Scots and English, the last on British soil, and the most historically significant for Scots. (I say basically because some Scots fought on the side of the English.) Scotland would never be the same again afterward. 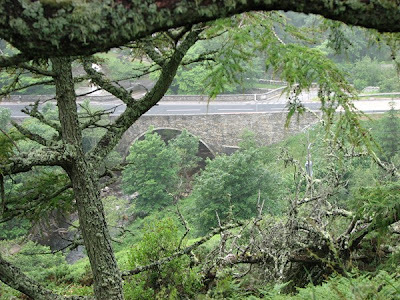 The Highland Clearances followed, the clan system was destroyed and the clans disbursed. The English Hanoverians tried to stamp out and destroy Scottish Highland culture so there would be no more rebellions. During this time, in the late 18th century and 19th century, thousands and thousands of Scots immigrated to America, Canada, Australia, etc. I won't go into detail about the battle. Entire books have been written on the subject. In a nutshell, Bonnie Prince Charlie was the descendent of the Stewart (Stuart) kings (originally Scottish), like King James VI & I. 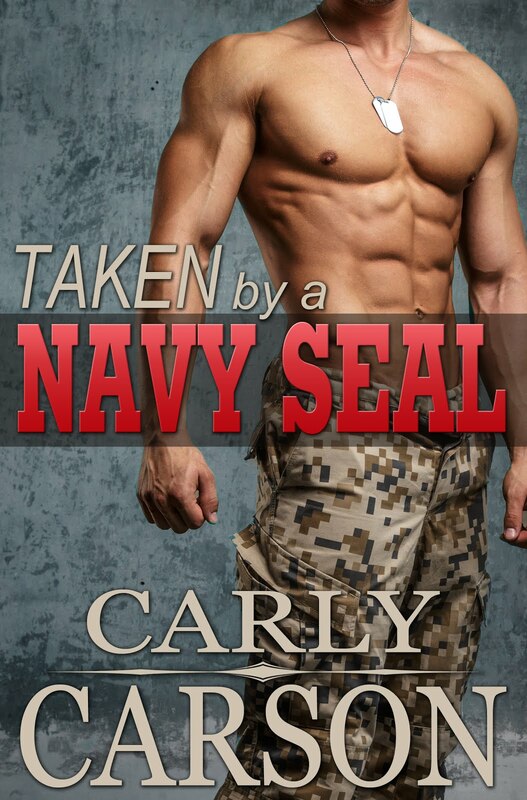 Their line had been dethroned years earlier but Charlie wanted the British throne. He had been raised in Europe, but he came back to the Highlands to find his Jacobite (relates to the Latin for James) supporters and to raise an army. He did and they stormed south, taking a few English cities but they stopped before reaching London. They headed back north, into Scotland before the final battle. The English or Hanoverian army had far better and more advanced weapons like musket rifles and canons. The Highlander Jacobites fought mostly with swords and daggers as they had for centuries. Thousands of Scots were killed. The wounded were murdered. The English suffered fewer casualties. Those who died were buried here in mass graves. Some in clan graves, some in mixed clan graves. These are marked with stones. A monument stands nearby. A red flag marks the Jacobite line and a yellow flag marks the English line where the soldiers stood before charging. 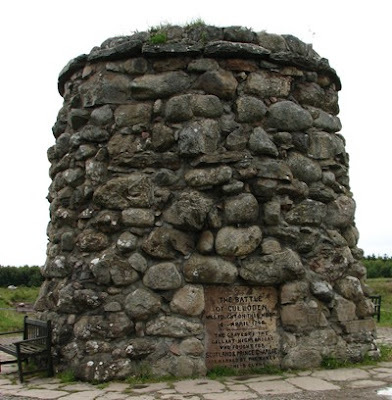 Culloden battlefield, also known as Drummossie Moor, is a wide flat bog land. It's wet and squishy with peat and water stands in places. Mountains lie in the blue, misty distance. Heather, thistles and other short scrubby plants grow here. Many of them were in bloom. I tried to imagine how difficult hand to hand combat would be in such a place if it was the same in the mid 1700s. Tripping over the foot tall scrubby bushes and plants would have been easy. The wind seemed to be blowing constantly while we were here and it seems a sad lonely place. But very beautiful. A one room crofter cottage sits nearby and apparently this was the field hospital. I don't see how it could've been much use considering the number of injured after the battle. But the restored cottage was fantastic, the most beautiful and original looking I saw during the whole trip. Again, since I write about croft huts sometimes, I was interested in looking at the structure in detail. My friend and I wanted to walk to the Jacobite line but unfortunately we noticed the time. Needless to say I was late to the bus again. I was not very popular with the driver at this point. Eeek. As a side note, something interesting happened earlier, when I first walked onto the battlefield. 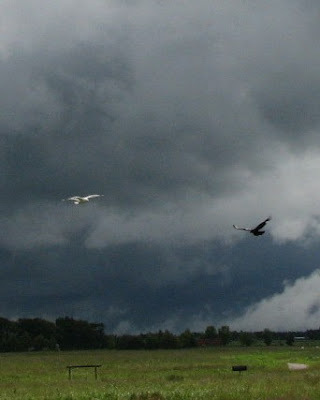 Close in front of me, two birds crossed in flight, one black and one white. The symbolism gave me a chill.